New this summer, this techy shirt is designed for the outdoor enthusiast and built for mountain and everyday adventures. 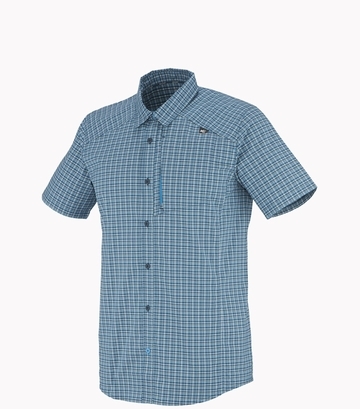 The Sorona short sleeve shirt offers great comfort for alpine and urban activities. The Drynamic Sorona Checker fabric from DUPONT is a new generation of polyester fiber developed with a share of recycled plant fibers that feels just like cotton. It is cool, breathable and moisture wicking. Quickdry and Anti UV treatments provide additional wicking performance and UV sun rays protection. The Regular Fit prioritizes comfort and ease of movement with a great deal of room to accommodate layering without binding or restricting movement. A quick access, zippered chest pocket allows to stow small items, making the Sorona shirt ideal to wear on hiking sessions, mountain outings and for a casual style, as a stand-alone piece, for everyday comfort.